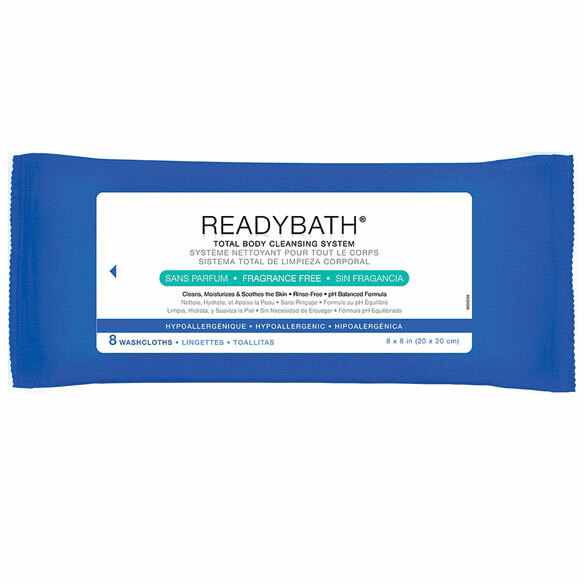 Pre-moistened, ReadyBath® bathing wipes clean, moisturize and soothe skin and don’t require rinsing. Hypoallergenic, pH-balanced, alcohol-free bath wipes are gentle on skin. Latex free. Use disposable bath wipes at room temperature or warm for extra comfort. Remove one cloth at a time to cleanse body, then discard. For individual use only. No rinsing necessary. Heating Instructions: For optimal comfort, READYBATH can be warmed. If using a microwave, warm for 30 seconds and test washcloth. Continue to warm until desired temperature is achieved. READYBATH can also be used at room temperature. I use them to clean my body. They are nice and thick and only mild scented. Just what I want. Love the convenience of toss away. I use this product everyday and it really works. Its so soft and smells great. These are perfect for anyone who has a chronic illness like arthritis or Fibro & finds it hard to shower every day. These can be used on the bad days instead of a bath or shower. They are soft & comforting. Good for a quick clean up if you absolutely can't shower. I have a standing order on these . My Husband has dementia, I'm his caregiver, there are a lot of things he can not do for his self, these come in handy when personal hygiene is not what it should be. I would buy this product over ànd over again. I use this product in between showers and it makes me feel fresh and clean. I buy this product automaticly every month. My husband has dementia some times there are accidents they come in very handy. needed for elderly mother who has difficulty bathing. These are really great for quick clean up. For keeping clean between showers. These bath wipes work great for those with limited mobility who can't get into a tub or shower. A daily shower doesn’t stop irritation from developing in skin folds where sweat gathers during the day. 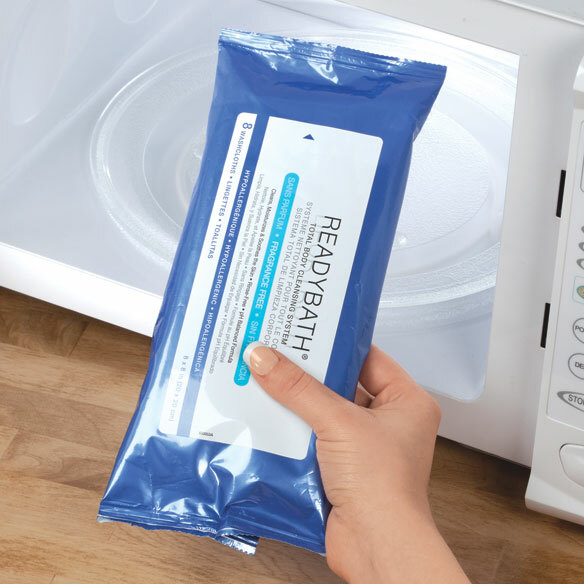 These bath wipes are very effective for quick and easy cleaning of these areas throughout the day. Especially helpful during high heat and humidity. I will have foot surgery soon. Showers during that time will be difficult so I want to try this out. Fantastic way of keeping clean when you go camping. Also, I use after bathing because they keep my skin smooth. They person wanted this item. I've purchased this item in a local pharmacy-type store and they work very well however, they are not always in stock when I need them leaving me no other choice but to either purchase their store brand (not comparable), try to find another store that has them or go without them altogether. I'm glad this company has them. Getting them here saves me time and money because they're the same price individually and since I always purchase more than one package, I'm saving a dollar per package! like , I used before. This makes it easier when you cant get in the tub/shower to clean yourself. I love these wipes!!! Great for a quick cloth bath!! Larger wipes are easier to use than "wet wipes"
Thought i'd try this on a trip. It's very useful in circumstances when unable to shower or bathe. Will have some limitations after having shoulder surgery in a few weeks and this just seems like something I can use. Would like to try before recommending. Can't always take a shower. Have used in the past. Works well, as adcertised. I use these between showers which I need help taking, but I can use them on my own. I love them and recommend any disabled person who wants some independence back. I use to take a shower every day. Can't do that now so I use these to make me clean daily. Do to RA I have a hard time showering as often as I like. These are wonderful and really make you feel like you’ve just had a bath. Need for mother-in-law in assisted living who occasionally has accidents and refuses to use shower. BEST ANSWER: Thank you for your question. You get 8 wipes and they are 8 x 8 inches. We hope this information will be of help to you. BEST ANSWER: Thank you for your question. There are 8 wipes per package. We hope this information will be of help to you. There are eight wipes in a package. They are great. How many in each package? BEST ANSWER: Thank you for your question. it is 8 wipes per package. We hope this information will be of help to you. There are 8 washcloths 8x8in Very handy !